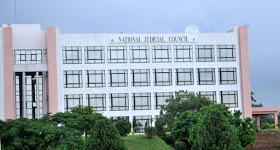 The National Judicial Council (NJC) has asked President Muhammadu Buhari to dismiss two judges accused of bribery by the anti-implant service, EFCC. The affected judges are Rita Ofili-Ajumogobia of the Federal Supreme Court and James Agbadu-Fishim of the Nigerian National Industrial Court. Complaints about corruption against both judges and Mrs. Ofili-Ajumogobia are already being prosecuted by the EFCC. The NJC said it came to that conclusion after examining the allegations against both judges. The NJC also rejected the voluntary withdrawal of another judge and asked for a lawyer to be punished by the competent body.